Are you looking for a simple, yet effective, way to make your home warmer and more inviting? Carpet flooring in Baton Rouge, LA will bring a fresh, welcoming atmosphere to your home’s interior. Installing just the right carpeting in your living area, bedroom, or anywhere in your home will transform your entire household and make it feel as fresh and new as the day you moved in. We take pride in offering a wide range of beautiful, affordable flooring that will represent your needs and personality. Stop by our locally owned and operated store to find just the right carpeting that suits your specific style and taste. 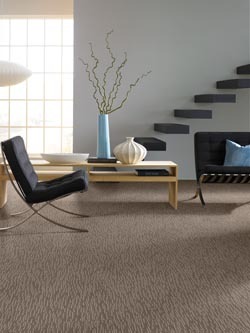 Regardless of your design preference, you are sure to find a carpeting option that will complement your living space. The sales specialists in our showroom are flooring experts. We consider individual décor choices, learn about your lifestyle, and teach you about your material options. Visit our showroom to find carpet flooring that you will love. Why Consider Carpeting for Your Home? Cost is a major consideration when purchasing carpet for your home. Buying carpet at wholesale prices allows you to pay just a small fraction of the cost that you would pay when buying from most retail stores. When wholesale companies buy carpeting products, they usually pay factory-direct costs and then sell the carpeting to business persons such as contractors and interior designers. When you buy carpet wholesale from us, you bypass the “middleman” in the deal, so we pass the savings directly on to you. A popular carpeting choice for generations, Berber carpet with its loop piling offers a variety of benefits. It comes in a huge assortment of textures and colors, all available at very reasonable prices. Berber carpet’s looping makes it easy to clean. Most spills sit on its surface, allowing you to clean them up before they sink into the fibers. Multi-colored Berber is also good for masking soils and stains. Once found mainly in home basements, Berber carpeting is now seen throughout the home because of its casual, inviting look combined with a full, comfortable feel. Solid-colored Berber carpeting also provides a relaxing atmosphere for more formal areas such as living rooms. Our commitment to customer service and quality flooring means we are continually adding new stock and carpeting options to the ever-expanding showroom at our carpet store. A range of materials and styles are available in many name-brand options. Professional installation involves adding a layer of padding, stretching the carpet, and hiding any seams. Our carpeting specialists have many years of experience in this area and provide quality installation that lets you and your family enjoy your carpeting investment for many years to come. Contact us today to book your free in-home estimate concerning carpet flooring for your home. We proudly serve the communities of Baton Rouge, Prairieville, and Galvez, LA.